Nightbird Books and The Big Picture House present The Iron Giant, the animated film based on the children's book by Ted Hughes. This is one for the whole family. Notably married to Sylvia Plath (1956-1963) with whom he had two children. Also had a daughter Shura (b. 1965), killed by her mother Assia Wevill as part of her suicide in 1969. Hughes was chosen as Poet Laureate after Philip Larkin declined. Ted Hughes's book The Art of Losing was available from LibraryThing Early Reviewers. 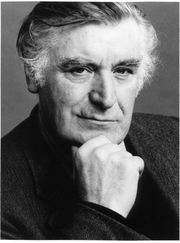 Ted Hughes is currently considered a "single author." If one or more works are by a distinct, homonymous authors, go ahead and split the author. Ted Hughes is composed of 4 names. You can examine and separate out names.